Sophsterlicious • UK Blog: - Sleek NOTD : Oxford. Hi everyone, Apologies for the lack of blogging recently, I'm away at my mums with my boyfriend. We are dog/house sitting. I should get back to some more blogging over the next week or two. Here is a recent nail of the day from Sleek. 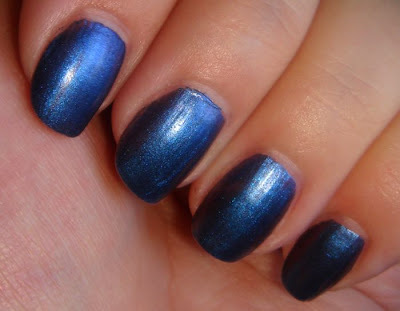 This is a gorgeous deep, shimmering navy shade, called Oxford. I love the polishes from Sleek, they are opaque, glossy and long lasting, this shade is a fave, but probably more of a autumn/winter colour. It looks awesome - think I'll be having that! Did you use a base & top coat? ooh this color is gorgeous!